Research ships left Teira Fishing Port for the coast of Camp Schwab. 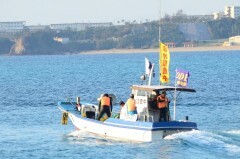 At Teira Fishing Port in Nago around 8:30 a.m.on December 15. On the morning of December 15 overnight after a national House of Representatives election,　underwater research activities by the Okinawa Defense Bureau were confirmed off the coast of Camp Schwab in the Henoko district of Nago. The U.S. and Japanese governments plan to relocate U.S. Marine Corps Air Station Futenma to the area. By 9 p.m., at least eight research ships had left Teira Fishing Port. About 80 citizens gathered in front of the Camp Schwab gate and celebrated the outcome of the House of Representatives election, in which four candidates against construction of the new base won all the Okinawan seats.